The XP PhotoGear Bendable Portaflex Reflector Panel features a 10.5 x 8.0" white panel for bouncing light from an on-camera shoe-mounted flash unit. It bends for complete control over your light and is useful when direct, but soft light is needed. This reflector attaches to the flash with a strap with hook-and-loop fasteners. Box Dimensions (LxWxH) 10.0 x 7.5 x 0.3"
Portaflex Reflector Panel (White, 10.5 x 8.0") is rated 4.0 out of 5 by 1. 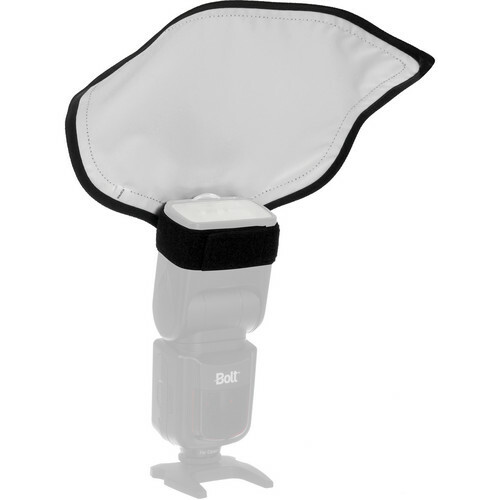 Rated 4 out of 5 by JOHN H. from Versatile reflector This reflector can be configured in many shapes to direct. The light in the desired direction. It's easy to set up and easy to stow. Is the Hook and Loop strap attached to the reflector itself, or is it a separate piece? The hook and loop strap is a separate strap unattached to the reflector. XP PhotoGear also sells the straps separately if needed.